Rep. David Cicilline (D-RI) introduced the Assault Weapons Ban of 2018 (HR 5087) on Monday and he has 167 co-sponsors as of now. They are all Democrats. · And 205 specifically-named and listed firearms. The bill has almost a hundred pages of long arms that would be exempted under the bill. It is as if the authors of the bill took a bunch of back issues of Gun Digest or Shooters Bible and just copied them. Appendix A features such firearms as Purdy side by side shotguns, Holland and Holland double rifles, and Ruger M77 bolt actions. It does, to be fair, include some Ruger 10/22s. The meat of the bill is in the definitions. Here is the definition of "semiautomatic assault weapons" which then follows a multi-page list of listed firearms. ‘‘(iii) A folding, telescoping, or detachable stock. ‘‘(iv) A grenade launcher or rocket launcher. ‘‘(B) A semiautomatic rifle that has a fixed magazine with the capacity to accept more than 10 rounds, except for an attached tubular device designed to accept, and capable of operating only with .22 caliber rimfire ammunition. ‘‘(C) Any part, combination of parts, component, device, attachment, or accessory that is designed or functions to accelerate the rate of fire of a semiautomatic rifle but not convert the semiautomatic rifle into a machinegun. ‘‘(ii) A second pistol grip. ‘‘(iv) The capacity to accept a detachable magazine at some location outside of the pistol grip. ‘‘(v) A semiautomatic version of an automatic firearm. ‘‘(E) A semiautomatic pistol with a fixed magazine that has the capacity to accept more than 10 rounds. ‘‘(i) A folding, telescoping, or detachable stock. ‘‘(iii) A fixed magazine with the capacity to accept more than 5 rounds. ‘‘(iv) The ability to accept a detachable magazine. ‘‘(vi) A grenade launcher or rocket launcher. ‘‘(G) Any shotgun with a revolving cylinder. ‘‘(K) All belt-fed semiautomatic firearms, including TNW M2HB and FN M2495. ‘‘(L) Any combination of parts from which a firearm described in subparagraphs (A) through (K) can be assembled. ‘‘(M) The frame or receiver of a rifle or shotgun described in subparagraph (A), (B), (C), (F), (G), (H), (J), or (K). The bill goes on further to ban the sale, import, possession, transfer, or manufacture of "semiautomatic assault weapons" after the date of the enactment of the bill. It would grandfather those in circulation made before that date. Moreover, the ban would not apply to the military, police, armed guards, etc. or in other words, "only ones". Indeed, retired LEOs could be sold their "semiautomatic assault weapon" upon their retirement. The bill would ban "large capacity ammunition feeding devices". These are defined as "a magazine, belt, drum, feed strip, or similar device, including any such device joined or coupled with another in any manner, that has an overall capacity of, or that can be readily restored, changed, or converted to accept, more than 10 rounds of ammunition." There is a safe storage requirement for grandfathered "semiautomatic assault weapons" that requires them to be inaccessible to prohibited persons. Finally, the bill would require any grandfathered "semiautomatic assault weapons" to be transferred through a licenses dealer. There are a few other things in the bill such as appropriations for gun buy-backs and notification requirements on the part of dealers if a prohibited person attempts to buy a grandfathered "semiautomatic assault weapon". As I'm reading paragraphs A and D, if the firearm in question could take a detachable magazine and any one of the listed items, then it is a "semiautomatic assault weapon". That would include virtually all semiautomatic rifles and pistols as you have replacement stocks, replacement threaded barrels, etc. that would make the rifle or pistol thus fall into this category. If you think I'm reading this wrong, feel free to correct me. The exceptions, of course, are those specifically listed by model in Appendix A. 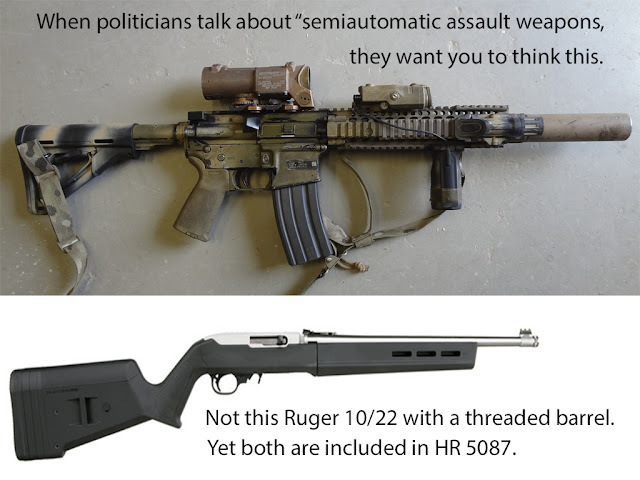 However, even those could become one of those evil "semiautomatic assault weapons" if you replaced the stock with a pistol grip stock or had the barrel threaded. What also is not said explicitly in this bill is that you could not use a suppressor on any post-ban gun unless it attached by a means other than threading on to the barrel. Thus, this bill indirectly would put a crimp on what is in reality a safety device. I posted a meme the other day talking about raising the age to 21 to buy a rifle. With a little rewording and replacing a standard wooden stocked Ruger 10/22 with one that has a threaded barrel, the meme still stands. They want you to think its only one thing but they mean its everything. I'm not sure given what we've been hearing out of President Donald Trump's mouth if this is too late or not. Nonetheless, it is important to go on record and make the call. The recent tragedy in Parkland, Florida, underscores the continued failure of "gun-free" zones. Creating target-rich environments, and then relying on government ineptitude to "secure" those environments has proven time and time again to be a recipe for failure. Unfortunately, the anti-gun movement is seizing this moment (as they do with every other tragedy) to push an agenda that will turn your Constitutionally-protected right into a narrowly carved out privilege. Grass Roots North Carolina stands firm with Gun Owners of America,who recently noted that "If President Donald Trump’s goal is to ban bump stocks, then that is a gross infringement of Second Amendment rights. GOA has long warned that such a ban can easily be applied to triggers, magazines, or semi-automatic firearms." It is critical that we remind President Trump that pro-gun voters like you elected him to stand firmly in support of the Second Amendment! SIGN OUR PETITION: Please visit our website athttps://www.grnc.org/trump to sign our petition to President Trump to stand firmly with the Second Amendment, and to oppose the latest round of corporate-funded gun-grabbing hysteria. PHONE AND EMAIL THE WHITE HOUSE: Let's light up the White House switchboards and remind them that pro-Second Amendment voters like you voted for President Trump for a reason. The phone number is 202-456-1111 and the email link is https://www.whitehouse.gov/contact/. DONATE TO GRNC: Unlike the billionaires that create astroturf gun control lobbies, Grass Roots North Carolina is run by volunteers and funded by people like you; regular, law-abiding Americans that value their rights and freedoms. Please consider making a donation to GRNC by visiting this link:https://www.grnc.org/join-grnc/contribute. Hello. I am calling to tell President Trump that, as a law-abiding gun owner, I oppose any of the gun control efforts currently being discussed. This includes banning bump stocks or any other devices to modify rate of fire, raising the minimum age of any firearms purchases, or the expansion of any "gun free zones" that continually put our citizens at risk. Thank you for your time. HR 4240, the Public Safety and Second Amendment Rights Protection Act of 2017, is being pushed for a vote by virtually all the Democrats in the House plus another 11 Republicans. Rep. Mike Thompson (D-CA) filed a discharge petition on Monday to get it brought from the House Judiciary Committee to the floor of the House for a vote. I should note at this point that no hearings have been held on the bill since its introduction. Reauthorization of the NICS Program. Grants to the state to improve and automate reporting of prohibited persons. There are also penalties for failure to do so. Amend HIPPA to allow mental health records to be reported to NICS database. A relief from disabilities provision. Require ALL firearm sales at a gun show to have a background check. Require ALL firearm sales as a result of a ad, listing, posting, or other display to have a background check. This would include both sale ads and want to buy ads. Transfers without background checks due to gun show or Internet ads will be subject to a fine and/or 5 year prison sentence. Prohibition of a gun registry (for now). This is being pushed hard by the Brady Campaign as it goes far beyond the FixNics Act passed by the House as well as the Senate version. Noticeably absent is any penalty for Federal departments such as DOD for failure to report prohibited persons. The dates after their names indicates when they became co-sponsors of the bill. I intend to let my local Congressman know that I'm opposed to this bill as I see it as merely a first step along the road to universal background checks. We also know that there is no such thing as a "gun show loophole" and a "Internet loophole". They are made up constructs to vilify the sale of private property within the spirit and letter of the Gun Control Act of 1968. Finally, in an ironic twist, the name of this bill - the Public Safety and Second Amendment Protection Act - is the same one chosen by the Kafkaesque Manchin-Toomey bill. Oh, Di, you are so unbelievably stupid. Chris Baker at Lucky Gunner Labs has done yeoman's work testing all manner of handgun self-defense ammo. Everything from .380 ACP to .45 ACP in pistol cartridges as well as both .38 Special and .357 Magnum in revolver cartridges were tested in ballistic gelatin. I don't consider a .380 ACP expanding to half an inch to be "like a nail". As a reminder, No Lawyers - Only Guns and Money blog is an affiliate of LuckyGunner.com. 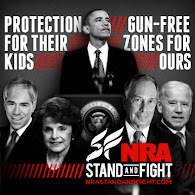 Any commissions earned are donated to Second Amendment organizations to protect our rights. A number of gun related bills may be acted upon today in the Illinois General Assembly. Both Illinois Carry and the Illinois State Rifle Association have issued alerts. Speaker Mike Madigan has a number of "shell" bills which can, and probably will, be filled up with anti-gun legislation. It is time to call your state rep and state senator if you live in Illinois. Monday, these Mike Madigan shell bills from last year were given new life, as Mike Madigan's gun grabbing minions fulfill their mission to be pawns in Madigan's "Gun Day" Wednesday, TODAY February 28 by giving each of the shell bills a brand-new anti-gun amendment The bills are HB1465, HB1467, HB1468,HB1469 and HB1664, and they all passed out of the House Judiciary Committee on a partisan 8 to 5 vote. Remember that all of these legislators are beholden to Madigan to carry these bills, or they get no campaign "support" for the fall. But these representatives already hate that you have the freedom to own firearms, so for them this is no stretch. They want to take that freedom away, they have been awaiting the opportunity. Please call your Illinois State Representatives today, starting at 8:30 am and ask that they oppose all these bills. Don't stop there, tell your neighbors and friends about this attack on our freedom, let them know to make the calls as well. Please use the link below to identify and get contact information for your Illinois State Representative and Illinois State Senator, then keep that information handy. There are now floor fights on several fronts in Springfield in attempts to take away your gun rights, you will be asked to call your legislators several times this week. Witness Slips and Phone Calls Needed! Four anti-gun bills were filed in the Illinois House today and are scheduled to be heard in Committee on 2/28/2018. Don't delay! File Witness Slips opposing the amendment (HFA1) on all four bills immediately! Make sure to also include these bills in your opposition phone calls to your State Representatives. President Donald Trump, the black letter law notwithstanding, told the nation's governors on Monday that he is "writing out" bump fire stocks. “Bump stocks, we are writing that out. I am writing that out,” he said, addressing a group of state governors at the White House. “I don’t care if Congress does it or not, I’m writing it out myself." The president’s comments come after the Feb. 14 shooting at a Florida high school that left 17 students and staff dead. Last week, he directed the Department of Justice to create regulations that ban bump stocks. Trump also said bump stocks should be put into the same category as certain firearms, making it “tough” to get them. Now yesterday, Attorney General Jeff Sessions said he thinks the Department of Justice has the legal authority to prohibit bump fire stocks. "We believe in that, and we have had to deal with previous [Bureau of Alcohol, Tobacco, Firearms and Explosives] ATF legal opinions, but our top people in the Department of Justice have believed for some time that we can, through regulatory process, not allow the bump stock to convert a weapon from a semi-automatic to a fully automatic," Sessions told state attorneys general, according to Reuters. ATF has previously said that it does not have the authority to regulate bump stocks, which increase the firing rate of semi-automatic rifles. For once, I think BATFE actually got it right when they said they don't have the authority to regulated bump fire stocks. So does the Firearms Policy Coalition. They have retained attorneys Joshua Prince and Adam Kraut of the Firearms Industry Consulting Group to submit their response when the rulemaking is announced and to help with any litigation related to the rulemaking. They have promised to go to court if any rule banning bump fire stocks is adopted without any Congressional change in the law. WASHINGTON, D.C. (February 26, 2018) — In a press conference today, President Donald Trump said that, “I don’t care of Congress does it or not, I’m writing [so-called ‘bump stocks’] out myself.” In response to these troubling statements, constitutional rights advocacy organizations Firearms Policy Coalition (FPC) and Firearms Policy Foundation (FPF) have announced that they have retained attorneys Joshua Prince and Adam Kraut of the Pennsylvania-based Firearms Industry Consulting Group, a division of Civil Rights Defense Firm, P.C., to submit their legal opposition to any rulemaking and begin preparing for litigation. Last month, FPC submitted a legal letter of opposition to the Bureau of Alcohol, Tobacco, Firearms and Explosives’ advanced noticed of proposed rulemaking on the “Application of the Definition of Machinegun to Bump Fire Stocks and Other Similar Devices.” In its comments, FPC explained that the “DOJ and BATFE clearly lack the statutory authority to re-define the targeted devices as ‘machineguns’,” and that these ATF-approved and legally-possessed devices could not be regulated firearms under the statutes. FPC and FPF oppose restrictions on the acquisition, possession, carry, transportation, and use of semi-automatic firearms, ammunition, and firearm parts and accessories by law-abiding people. “We will use every resource and remedy available to us in our ongoing defense of the Constitution, the rights it protects, and millions of law-abiding American people” said FPC President Brandon Combs. “While we would prefer to block any executive action or rulemaking that would ban currently-legal firearms parts before it becomes law, we would not hesitate to file a federal lawsuit to protect the rights and legal personal property of gun owners if that’s what it takes.” Those who wish to support FPC and FPF’s efforts to oppose executive branch gun control and support legal action a can make tax-deductible donation at www.defendgunparts.com. Individuals can become a member of FPC at www.firearmspolicy.org/join. Firearms Policy Coalition (www.firearmspolicy.org) is a 501(c)4 grassroots nonprofit organization. FPC’s mission is to protect and defend the Constitution of the United States, especially the fundamental, individual Second Amendment right to keep and bear arms. Firearms Policy Foundation (www.firearmsfoundation.org) is a 501(c)3 grassroots nonprofit organization. FPF’s mission is to defend the Constitution of the United States and the People’s rights, privileges and immunities deeply rooted in this Nation’s history and tradition, especially the inalienable, fundamental, and individual right to keep and bear arms. Firearms Industry Consulting Group (www.firearmsindustryconsultinggroup.com) represents individuals, organizations, firearms licensees, and others located across the United States in all matters relating to firearms and ATF compliance. FIGG is a division of Civil Rights Defense Firm, P.C. As an aside, the Adam Kraut mentioned in the release is the same Adam Kraut running for the NRA Board of Directors and the same Adam Kraut I have wholeheartedly endorsed. Is $5,200 The Price Of A Politician? Since the murders at Marjory Stoneman Douglas HS in Parkland, Florida, there has been a great debate going on about whether or not teachers and administrators should be armed or, at least, have that option. There are a number of states that do allow it. Moreover, there are fantastic programs like FASTER Saves Lives in Ohio and Colorado that will actually train faculty and administrators in violence response for free. The North Carolina Superintendent of Public Instruction is Mark Johnson. He is a Republican from Winston-Salem who had served on the Winston-Salem Forsyth County Board of Education prior to running for this office. Johnson posted on Twitter his position on arming North Carolina's teachers. As the Raleigh News and Observer points out about the tweet above, Johnson wants firearms on campus restricted to “these trained, uniformed law-enforcement professionals who courageously choose a career protecting citizens from violent threats.” If the armed Broward County Sheriff's Department school resource officer had acted as he should have to save student lives, then perhaps I wouldn't have so much trouble with this statement. The real trouble I have with Johnson's statement against arming teachers is that I suspect he is dancing to the tune of one of his largest campaign donors. On December 16, 2015, Johnson's campaign committee received a check for $5,100 from none other than Michael Bloomberg. Ten days later, Bloomberg's daughter Emma made an additional $100 donation to Johnson's campaign for a total of $5,200 from the Bloomberg family. Having scanned all his financial disclosure reports, Johnson only had three or four other donors who each gave $5,100. As I wrote back in March 2016, seeing such a significant donation from Michael Bloomberg to a candidate for a Council of State office in North Carolina made me feel wary. It didn't make sense back then but it certainly makes sense now. So the question for Mark Johnson is $5,200 the going rate for putting the school children of North Carolina at risk? Let's be frank here. Tom Fuentes, retired Assistant Director of the FBI and CNN's Law Enforcement Analyst, is ignorant. I might even go so far as to say he is a misogynist. He doesn't think women can carry concealed on their person other than in an outside the waistband holster with a heavy belt. Moreover, he gives the impression that this is the only way to carry. The women at A Girl and A Gun Shooting League wish to disagree. UPDATE: Kathy Jackson of the Cornered Cat gives her response to Tom Fuentes along with suggestions for how women can look both very stylish and carry at the same time. He wasn’t really asking, of course. He was just explaining that women really can’t manage the complex, manly task of carrying a gun. Based on his wide experience as being a woman who carries a gun, I guess? This would pretty well be the definition of ‘mansplaining’ — not a word that I’m generally a fan of, but it fits. Fuentes, who is not a woman, felt it necessary to explain on national television that women cannot discreetly carry a gun. I was a guest yesterday on Episode 24 of the Guns, Freedom, and Politics radio show with Paul Valone. We discussed the failures of law enforcement at Marjory Stoneman Douglas H.S., President Trump's gun control proposals, the media narrative of events, and what would have worked. Paul suggested everyone call the White House comment line at 202-456-1111 to let him know where you stand on his proposals regarding bump fire stocks, raising the age to purchase a long arm, and universal background checks. The key thing regarding bump fire stocks is not the stocks themselves but rather if it is interpreted to include anything that might accelerate the rate of fire such as a trigger job, Geissele or Timney triggers, or a different buffer weight. Paul has made the recording available as a YouTube video. You may want to subscribe to his page so you don't miss future shows. The Colonel would be proud. 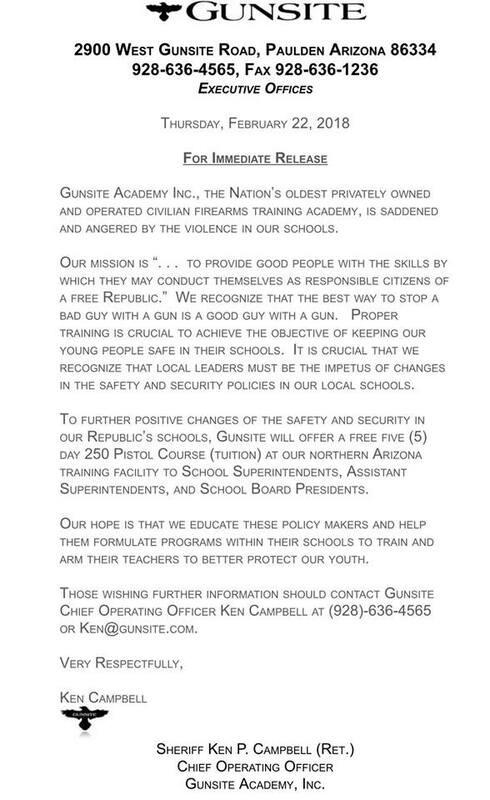 Gunsite Academy has stepped up to offer a free Gunsite 250 class to school superintendents, school board presidents, and assistant superintendents. This is an effort to educate them and help them formulate policies that would keep their students safe. A Gunsite 250 pistol class normally costs $1,750. Florida Carry issued a call late last week for legislators to eliminate gun-free zones, to authorize teachers with a CWFL to be allowed to carry in schools, and to immediately provide funding for a FASTER program. If you live in Florida, it's time to hit these legislators up. Today, the legislature is under attack. The candidates who came to us as Florida Gun Owners during the primaries have now become lawmakers. Those lawmakers are now being pressured in to selling us out. Investigate the non-response of the Broward County Sheriff's office to a clear and present danger, to demand that the FBI account for its failure to investigate multiple reported threats, Recognize that "gun free zones" are not free of criminal violence, and Provide for the lawful defence of FL students. It goes without saying that the gun prohibitionists in the Illinois General Assembly are trying to make hay out of the tragedy in Parkland, Florida. The Illinois State Rifle Association sent out an action alert yesterday saying that Wednesday, Feb. 28th, will be "gun day" in the legislature. If you live in Illinois, it is time to be calling your local representatives. Wednesday, February 28th, has been deemed “GUN DAY” by the Illinois Legislature, and the cast of anti-2A usual suspects will be amassing in the State Capitol of Springfield. They are emboldened by the fever pitch of the recent tragedy in Florida and feel the wind is at their back as they move, as always, to infringe further upon the rights given to us by our Founding Forefathers. The primary pieces of legislation that will be voted on will likely be overreaching “assault weapons” restrictions, the gun dealer licensing bill and its grossly inadequate trailer bill. We at the Illinois State Rifle Association and Springfield Armory are heartbroken and disturbed by the acts of violence in Florida, committed by a mentally unstable individual that so many that knew, and reported, to be a danger to our citizens. It is only natural in times like these to want to do SOMETHING. It is also in times like this that we must not act solely for the sake of acting. Clear headed discussions, free of emotion and knee-jerk reactions must be the order of the day. We must do something to protect our children so that these horrible acts are stopped for good. We also must do what is necessary to ensure the survival of our Second Amendment, the Amendment that protects all others. The Amendment our Founders trusted to our Republic with the words “Shall Not be Infringed”. These rights were fought for and earned with the blood of American Patriots at places like Lexington and Concord, Bunker Hill, and Trenton. Now is the time to act. With the specter of further 2A infringements looming tall over Springfield, Illinois in the coming week, it is imperative that you contact your State Legislators and demand that they uphold their Oath to protect the Constitution of our beloved United States of America – and let them know you oppose any type of “assault weapons” restrictions, the gun dealer licensing bill and its grossly inadequate trailer bill. Freedom is not free. It must be fought for against the forces who would happily give up our most sacred rights and freedoms. Firearms Restraining Orders In NC? No, Thank You!